Located at the highest point east of Hot Springs area. 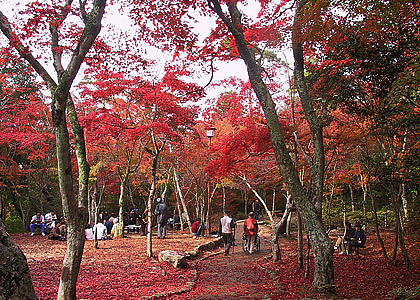 One of Hyogo Prefectures numerous famous foliage viewing. In 1951 this park was set up at the site of the Zuihoji Temple which was abandoned in the early Meiji Period. Toyotomi Hideyoshi had a vacation home in the area and once said that no matter how many times he sees the fall foliage there, he never grows tired of it. Taiko Hideyoshi’s beloved stone go board is located within the park. The Arima Tea Party takes place in Zuihoji Park every November 2 and 3.